MANILA, Philippines — The Philippine president, in his latest outburst against critics, warned he would declare a "revolutionary government" and arrest his detractors if he is pushed against the wall. "I have enough problems with criminality, drugs, rebellion and all, but if you push me to the extreme, I will declare the suspension of the writ of habeas corpus and I will arrest all of you," Duterte said, adding that he is willing to face the consequences. "I am willing to be hanged. I'm willing to die." Duterte's threat drew concern from democracy and human rights advocates. Former Commission on Human Rights chairwoman Loretta Ann Rosales said the country's 1987 constitution guarantees freedom of speech, including criticism of officials. She said habeas corpus, which requires the state to justify a citizen's detention, can only be suspended during specific contingencies such as war or dictatorship. 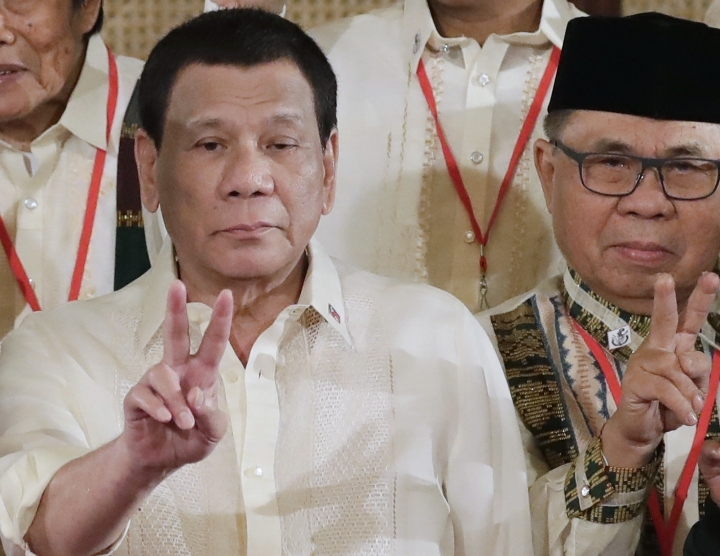 "The president should know that employing tactics from the Marcos playbook does not end well," Rosales said, referring to Ferdinand Marcos, the late Philippine dictator who was ousted in a 1986 popular revolt. Opposition Sen. Risa Hontiveros said Duterte should confront China over its increasingly aggressive actions in the disputed South China Sea instead of threatening civil liberties. "Instead of standing up to China's aggression, President Duterte threatens his own people with warrantless arrests and war," Hontiveros said. "There is no easy fix to a medical condition which is of a chronic nature, and so telling people to stop is not working," Dr. Gundo Weiler said at a news conference.